...until I pound the pavement from Devonport to Victoria Park via Takapuna, Northcote and the Auckland Harbour Bridge. Twentyone kilometers of scenic route (well, scenic for the whole 1km over the bridge), although I distinctly remember the last time when I did this *without any training* I practically cursed at myself the whole way vowing to never do it again *without any training*. Well here I am, 4 weeks to go, still trying to get over the flu and feeling pitifully sorry for myself, and with only 3 "training" runs under my belt that combined don't even add up to 21 I'm wondering how on earth I'm going to pull this off? At this point the only thing I'm thankful for is that I didn't go with my original idea of registering for the full marathon! Of course there is the option of not doing it, but my Asian brain thinks it's a waste of $100. What's more if I go and get the race pack with the T-shirt (you can't pay $100 and forego your race pack) I could never wear it in public if I didn't do the event because everyone seems to comment about it, and I'd be embarrassed to tell the truth, or even worse - lie about it. So it all boils down to the fact that I paid some money and my ego is compelling me to do the event, so I will - even if it kills me! We were busy on Saturday morning doing nothing in particular - it was another pity party for one going on in my head so there was no motivation whatsoever for anything. Jef had ducked out to the yacht at 6am to make sure it was still afloat and I'm pleased to report that it is indeed a seaworthy vessel. He reported that the sea was in a beautiful and glassy state of stillness, as evidenced in this awesome pic he took with his iPhone. It would have been so great to have been out there with him, but I did not fancy such an early start for both myself and Kien. We were snoozing together on the mattress in the lounge (he woke at 5:15am, I didn't have the stamina to sit at his cot reassuring him for an indefinite amount of time, so it was a justifiable reasonable time to take him to bed). It's OK, we've got all summer to look forward to. 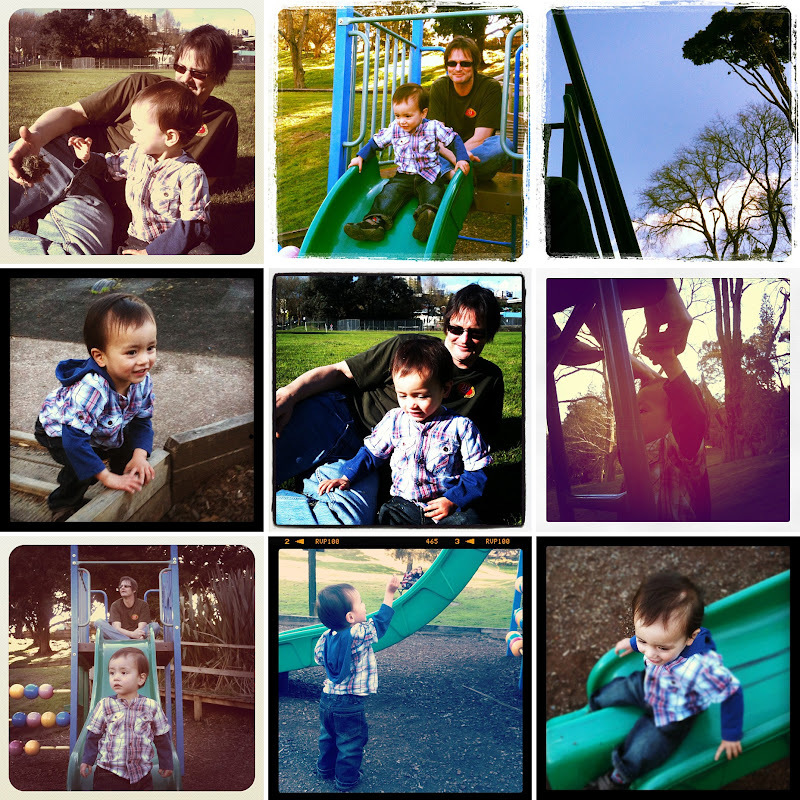 We did get out in the afternoon to Western Park. The aroma of freshly mown grass mingled with the sweet perfume of Freesias are my favourite smells for Spring. It invokes such vivid memories of childhood innocence and the promise of an invitingly long summer holiday just around the corner stretching out for what seemed like an eternity. I love being excited about something. It doesn't even matter what it is so long as I get that fluttering butterfly feeling in the pit of my stomach when I think about it. My limbic system does an upstanding job with making me feel good, like I am being slowly drip-fed endorphines at no extra cost. I feel this way when I witness my son's beaming smile. I feel this way when I catch Kien looking inquisitively at something. I feel this way when I can smell Spring floating through the breeze, soft and subtle, yet it packs such a punch to my imagination. As such, my memories will be selective, and these are the good times I will no doubt remember and look back on through fondly tinted spectacles, rose coloured of course. It was wet, and it was cold. Jef had escaped the confines of my grasp the night before to watch the All Blacks vs. France match in the city. It was healthy for him to be out with his friends, and I'm glad he had a great time. We lazed at home in the morning, and went to our boat shed in the afternoon. I like Northcote Point, and I like our boat shed. It is rustic and quaint, just how a boat shed should be. Kien helped Jef take measurements. He thought it was hilarious to run off with the keys. We were a bit worried they were going to end up in the water if we let him get away on us. I chased him around for a bit, then he discovered the joys of jumping up and down in the kayak. We went for a stroll but didn't manage to make it too far. Kien missed his daddy, and the further we walked the more upset he became. As the weather was already packing in I didn't want to be caught in the drizzle anyway. Our Firedancer is out there, waiting for us to make the most of the sea that surrounds this island. It's on the mooring, beckoning us to have wonderful adventures together. I can't wait, and I am excited about the endless possibilities. This is our yacht - Firedancer. We took him to see the doctor this morning - just to confirm he is on the mend. Daycare has been ancy all week about him being there. Admittedly he isn't 100 percent, but there isn't much we can do except to ride it out - and guess where he got it from in the first place? So just to be on the safe side the doctor prescribed a(nother) dose of antibiotics, and suggested he has a day off from daycare to appease them. I galloped off to work, and Jef trotted home with Kien. I got a phone call not long after I was at my desk from Jef to say he really needed to go in to work, so after I tidied up some bits and pieces I came home, and Jef zoomed off. Kien goes through stages of being deliriously happy to absurdly upset within a matter of minutes - all day long. When he is giggling and laughing the world is such a lovely place to be in, and when the whining and whinging sets in I can't even think straight because the incessant noise is at a pitch that makes one feel rather disturbed. Just as you think you can't take it anymore there is an interlude of pleasantry as the child gleefully amuses himself with whatever it is that snapped him out of his previous 3 minutes of torment. Just as you settle back in the comfy armchair to have a relaxing cuppa the toddler becomes frustrated that whatever is not doing what he wants it to do, which in turn sets him off on another 3 minutes of wailing...etc, etc, etc. One whole year of this to go. Oh joy. We've been through a bit of a rough patch with his sleeping as of late, but I kind of feel we are coming out the other side now. Today at nap time I gave him a cuddle and told him a story as per usual, but he didn't want me to finish the story. He pointed at his cot and said "sleep time" and did the sign. I put him in there, he hugged his koala and said "kitchen" as he turned over. Cracked me up - I usually put him down and tell him I have to go into the kitchen to do something. At bedtime tonight it was pretty easy as well. I give him a cuddle in the dark as I recite "Counting Rhymes" (it's the best bedtime story! ), and he knows it so well (I've read the book to him from day 1) that by the last line of the last verse he is leaning toward his cot getting ready to be put down. I give him his koala, tell him I'm going into the kitchen, tell him how much we love him and to have a good sleep, then leave. Thank goodness we are back to this place - where we were a couple of months ago. Long may it last! We just had to get out of the house this afternoon. When Kien woke up from his 1 hour nap he was cranky, and the only thing that finally got him out of his spin was the promise of going outside to do something. I had a vague idea that I wanted to be at a beach that had a park, so we got in the car and headed over the bridge. Mairangi Bay was where we stopped. We frolicked in the sand for some time before making our way back up to the grassy area. He found himself some rocks and insisted on sitting at the picnic table to play with him. He then had a brief swinging session. We then went to the next bay around, Murrays Bay. It is a really neat little beach. The council has built a walkway that takes you around the cove and connects to Mairangi Bay. I unfortunately did not have the energy to walk around with Kien. Kien had a great time finding rocks to throw. He absolutely loves throwing things. Time had escaped us, and I knew if we didn't get back to the other side of the bridge before rush hour we were stuck over on the shore. I headed home, but not before stopping at Salisbury Reserve. The afternoon was still young, and the bumble bees were out. He was extremely possessive over this "car". He was rather upset when another little person was playing on it and he made such a fuss. He didn't want anyone sitting on the seat with him. The other child (who was there first) was shy and got off for him. 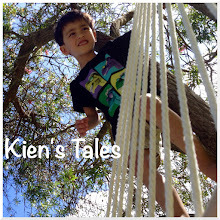 Kien is definitely a determined little guy. Needless to say there were tears and screaming all the way home from the park - not because he didn't want to leave the park, but because he had decided he wanted to ride his bike on the road. When I did not allow this he threw an absolute wobbly. I wasn't having a bar of it, so I packed all our stuff calmly into the vehicle, and I wrestled him into the carseat. Our 5 minute journey home was ear piercing! Getting into the house was not attractive either. But guess what? We got inside and all of a sudden he found something that pleased him (don't ask me what) and all was good in the world again. It was dusk, and Kien was fidgety. He kept asking to go outside. So what was supposed to be a quick zoom around the carpark on his bike turned into a playground visit to Western Park. Kien and his dad held hands while doing the double slide together. They both went down the tunnel slide too. The tunnel slide is Kien's favourite. He went down this slide all by himself before he could even walk. Being at the park in the dark is a lot of fun. I remember us doing this all of last summer. Yay, summer is coming. No more illnesses! I'm still trying to get over this horrible flu. Talk about cabin fever! By Sunday Jef and I just needed to get out. After coming up with a small list of things we could potentially do without it being too much hassle we decided to check out The Cloud. Situated at the western edge of Queens Wharf it is a pretty awesome temporary structure. It sported beams, lanterns, lights, and a giant screen that looked like a white iPad2 (maybe I'm the only one who sees the resemblance?). Kien got up on stage and enjoyed running and jumping around. He looks like he is doing a catwalk show. The weather was a variable mix of grey skies and sun showers. We got caught in a downpour and managed to find a spot on the side and underneath the sloping part of the tent. We were only out for a couple of hours (if that) but we were exhausted by the end of our little outing. It was so good to be out and about though - anything different than staring at the same four walls all day. It was also great for Kien, who got to stomp in a few puddles. I was back at work today, yay (although a few people did say I didn't sound too great and should go home), and Jef went to the doctors who told him he needed to be home a bit longer. Kien also managed most of the day at daycare, and was sent home at 15:30. When I dropped him off this morning I honestly thought they might just tell me to take him home right there and then. He was doing a good job impersonating a limpet, and I successfully pried him off and transferred to his favourite caregiver, Wendy. So all three of us together at home tomorrow. It will be really nice to have Jef around on a Tuesday, for a change. We've been poorly - one after the other we have fallen victim to some ghastly viral infection that won't let up. It hit Kien hard on Sunday, and when Monday rolled around there was no way he could go to daycare. So off to the doctor we went, and she referred us to Starship (due to his vomiting and lack of food intake it was precautionary). So 4 very long hours at the children's hospital. After lots of Ventolin and a few tantrums he was finally discharged. Tuesday was a write off - I could feel myself getting sicker by the hour, but thankfully Kien was getting better. He did some drawing. I'm not sure a lot of the marker ended up on any paper that I put out for him. There were a few unhappy moments, mainly due to, well, nothing in particular really. Just because 20 month olds can't control their emotions. A minute or so later it blows over, and he's back to being chipper and chatty again. If you were wondering, the answer is yes, we did stay in our pajamas for 2 days straight.